The human immune system is an extremely complex system of mechanisms that result from evolution over hundreds of millions of years. Over time, the body was trained to respond to pathogenic material invasions that attempt to infect the body. This involves both innate immunity, with no previous exposure to an invading microbe, and acquired immunity, whereby the immune system “remembers” how to deal with a microbe it has encountered before. Complications due to the immune response is a focal point in many areas, especially in the realm of transfusion medicine. Stowell’s past research focused on ABO (A, B, O) blood group antigens, the carbohydrate markers on the surface of red blood cells that dictate the immune compatibility of blood. His diverse clinical and research training guided his answers to fundamental questions regarding the development and consequences of red blood cell (RBC) alloimmunization, the body’s immune response against foreign antigens on RBCs. Blood is typed using the antigen markers found on the surface of red blood cells, with both the ABO group as well as the Rhesus (Rh) factor of positive or negative. The body is attuned to recognize cells like itself, paying close attention to the antigens attached to RBCs. When the body is exposed to foreign ones, for instance A+ transfused into O- patient, it triggers an immune response. This complication can cost a patient their life. Insight into the body’s extensive response to pathogens is useful for understanding this process. A system of 25 plasma proteins found in the blood, also known as the complement system, serve as an enhancement to the immune system and assist antibodies in destroying bacteria. This is part of the body’s innate immune system, the body’s immediate, non-specific defensive response to any foreign material. It uses chemicals in the blood and its immune system cells to attack. The first stage of the immune response is activated by the complement, catalyzing an immune cascade. The alarm is sounded, and chemotaxin chemicals are produced to entice phagocytes to the site of complement activation. Phagocytes are soldiers of the immune system, protecting the body by following the chemotaxin trail and eating through the membrane of harmful material (phagocytosis) like foreign particles, bacteria, or dead/dying cells. The invading pathogens are opsonized, a process that “marks” the bad material to increase the chance of it being destroyed. The complement system then releases chemicals to promote an inflammatory response, a factor that later can lead to the transfusion rejection. Phagocytes work in conjunction with the acquired immunity system, comprised of B Cells and T Cells. Also known as lymphocytes, these can turn into antibody factories to increase the immune response. They also work to direct the cells, reduce the immune response when it is no longer needed, and destroy host cells that are infected. The two systems are mediated through cytokines, which act as messengers to communicate and promote cooperation between them. During hemolysis, the targeted cell membranes burst and their contents flood into the surrounding fluid. This process becomes further complicated amongst patients in need of chronic infusions. Not only do these reactions compromise the transfusion’s efficacy, but they also compromise the health of the patients. These reactions alone represent one of the most common causes of transfusion-related mortality. The body’s excessive response to unlike antigens can produce a hemolytic transfusion reaction, in which the immune system targets the transfused cells. A mere 10mL of incompatible blood can produce symptoms, with risk of mortality increasing with the volume of material transfused. In a crucial and high pressure time in which immediate intervention is necessary, finding antigen compatible blood can sometimes be impossible. Something needed to be done to inhibit this growing complication. Stowell sought to identify the immunological mechanisms responsible for clearing transfused blood products. ACTSI Investigator Todd Sulchek, PhD, associate professor of bioengineering, George W. Woodruff School of Mechanical Engineering, Georgia Tech, worked with Stowell to develop the immunoengineered nano/microbeads. Complement protein plays a key role in controlling the immune response, and Stowell used this to his advantage. By employing Sulchek’s uniquely designed microparticles, they are capable of changing the environment of complement activation. The microparticles are designed to fit into the Fc receptor, a sort of antigen sonar present on many cell membranes of the immune system. 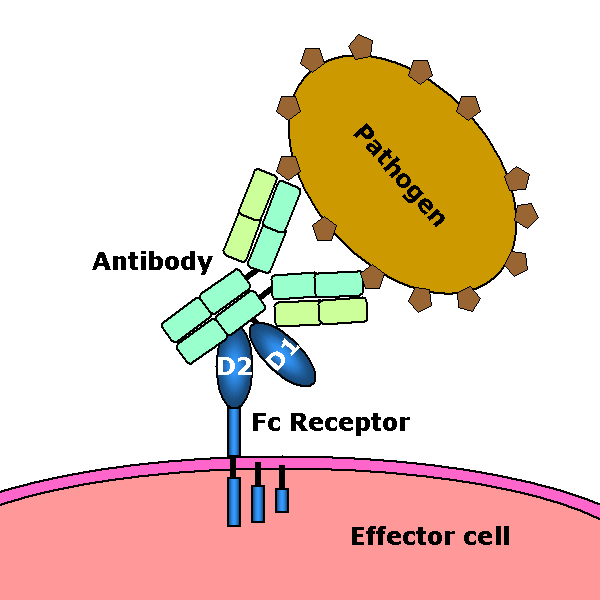 Because they send the signal for an immune response, reducing the Fc’s activity simultaneously reduces the immune cascade. These particles can be used to enhance or diminish the rate of destruction of cells in the immune response. Using this device, they were able to fix the complement of the donated blood in a way that masked the adverse red blood cell antigens. This would allow for safe transfusion and inhibit the patient’s immune response. This work was made possible through the generous support of ACTSI’s Pilot Grants program, a vehicle for the transformation of clinical and translational science in Atlanta. Stowell continues to make strides in transfusion medicine through his research on the enigmas of transfusion medicine, immunology/microbiology, and glycobiology. Read more about their recent publication in the Journal of Biomaterials Science here.